As we all know that the torrent is a software by which we can download large files from the internet without continuity.but the speed of torrents downloading is based on several factors such as leers,seeders.peers and internet connection. some times you face some difficulty of slow download because of less seeds. so here we are got a trick to download torrent files using IDM. IDM is a downloading software which gives us brilliant speed of download alos on slow network connection because of speed and stability this software is using widely. • IDM gives us high speed of download it increase download speed up to 4 times. • It also has a pause and resume capability as sometimes the file is broken due to some reasons so IDM has a resume button to resume the broken file and download it fast then any other downloader. • so that’s the reason why peoples need to download torrent files using IDM . 1. First method is using zbigz. •Sign up for your free Account. •After finishing sign up click on the upload button (on zbigz website ) . •Choose the file you want to download using IDM. •Then click on go button. • Next a window will popup asking for premium or free download. click on free download. • And then your files is ready to download with high speed of idm. 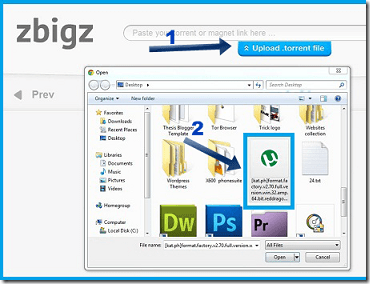 NOTE – using free account of zbigz u can download up to 1GB size file only. if you want to avoid this limit you have to sign up for a premium account. you can also use these sites instead of zbigz . Just same as the details given above. Any query? please comment below.